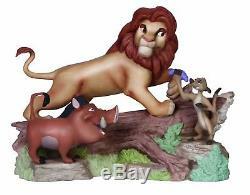 Precious Moments, Disney Showcase Collection, Friendship Means No Worries, Bisque Porcelain Figurine, 141705. Product Dimensions: 8.5 x 4.1 x 6.4 inches. Item Weight: 2.18 pounds. From Disney&###x27;s acclaimed 1994 animated film, The Lion King, Simba, Timon and Pumbaa happily forage through lush jungles. Depicting the motto of hakuna matata or no worries, the worries of these three friends just melt away when they are together. Give as a birthday gift, holiday gift or &###x27;just because&###x27; gift to the one you are just wild about, or anyone who loves all things Disney and The Lion King. Meticulously sculpted in fine bisque porcelain and expertly hand painted. Approximately 6.5 inches high. From Disney's acclaimed 1994 animated film, The Lion King, Simba, Timon and Pumbaa happily forage through lush jungles. Give as a birthday gift, holiday gift or'just because' gift to the one you are just wild about or anyone who loves all things Disney and The Lion King. In regards to order cancellation requests, we will do our best to accommodate your request but we cannot guarantee that these request will always be granted. Do you need your item quicker than that? We are not responsible for any incorrect or undeliverable addresses. Open software, music, games, movies, food items (human or pet, opened or closed), and personal hygiene products are not eligible for return. Message us for return instructions. Do you have a question about an item or order? Invoices or special request are not guaranteed. We do not accept best offers on any items we sell. We would love to be given the opportunity to work with you to resolve any problem you may have. The item "Precious Moments, Disney Showcase Collection, Friendship Means No Worries, Bisqu" is in sale since Tuesday, March 27, 2018. This item is in the category "Collectibles\Decorative Collectibles\Decorative Collectible Brands\Precious Moments\Figurines\Other Precious Moments Figures". The seller is "buyagain" and is located in La Mesa, California. This item can be shipped to United States.